REEDS HOUSE CLEARANCE based in Ashford is a full-service company, offering free on-site estimates and a guaranteed arrival window. Our local team can remove anything from anywhere! We cover Ashford, Canterbury, Maidstone and along the coastline from New Romney up to Dover, including Folkestone and Hythe. Pick up the phone for a straightforward quote or to arrange a visit if you are unsure of what needs clearing - no-obligation! We price based on volume.When we arrive, just point to the junk you want removed and we’ll provide you with an all-inclusive price -- it’s that simple. We'll clear your garage, shed, outbuildings... in fact, we'll clear anything from anywhere. It’s not just rubbish to us! We do our best to recycle as much as we can. When you use us you’re helping to keep rubbish out of the landfill. We take care of it all - Tel: 01233 66 22 72 Today! Reeds House Clearance in Ashford, Kent is your full-service 'rubbish' removal company. We offer rubbish/junk removal services for your home or business. We’re the house clearance company that handles the tough stuff – and we ensure that your 'stuff' is recycled or otherwise disposed of responsibly. Do you have old furniture, appliances, electronics, tyres, construction debris, or garden waste you need to make disappear? House, flats and business premises cleared. Make more space in your loft, attic or basement. 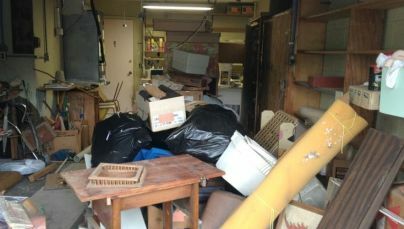 Landlords - we'll deal with squatter waste clearance. Garage, shed or outbuilding waste collected. 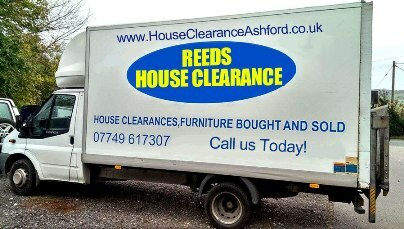 Reeds House Clearance can take away almost any material we can fit in our vehicles, without you ever lifting a finger. We’ll remove rubbish from wherever it’s located, and we won’t leave a dent or speck of dirt behind. When we say we're your full-service House or Garden or Shed clearance company, we really mean it. "We called on Reeds House Clearance to assist us with a house clearance when my mother passed away. 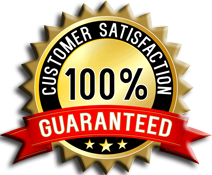 They handled the clearance efficiently and with sensitivity and expertise. Thank you very much"
"We would thoroughly recommend Reeds House Clearance. Punctual to the minute, very fast clearance, no standing around chatting... very reliable and honest. They cleared my fathers house on a Saturday, which was brilliant for us, as we can't get time off from work Monday to Friday." Reeds House Clearance, committed to providing a 1st class service at a very competitive price! Reeds House Clearance is based in Ashford and provides House Clearance, Garage Clearance, Shed Clearance and Outbuilding Clearance in Ashford, New Romney, Dymchurch, Hythe, Folkestone, Dover, Canterbury, Maidstone and all surrounding areas.